He is the Straw Hat crew's general physician despite being a reindeer. After a set of unusual circumstances, he ate the Hito Hito no Mi (Human Human Fruit), which permitted him the ability to speak, think, and (to a limited extent) change into a human Chopper often acts like a child, but he is an upright friend and companion who will try anything to overcome a task given by his team. He also still has distrust in humankind because of events his youth, where he was treated as a brutal monster. He will often outright insult a human who compliments him while smiling, dancing, and being obviously pleased. He also shows a certain interest in books, but mostly medicine related ones. Chopper is more or less on a journey to define himself, seeing almost anybody on his crew as a role model. This, combined with his naiveness, often causes him to imitate the other Straw Hats' actions, no matter how obviously silly. Because of this, he often gets involved in the crazy antics of Luffy and Usopp, wholeheartedly believing that what they are doing is sensible and fun. 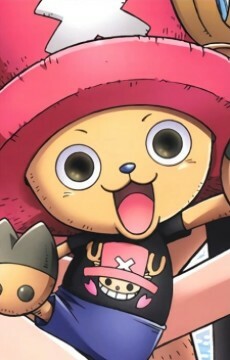 Chopper is one of the most innocent Straw Hat Pirates, and is also very naive, resulting in a tendency to believe anything told to him, even the outrageously fictitious and exaggerated lies of Usopp. Sanji originally wanted to cook Chopper and continues to refer to him as "the emergency food supply" to tease him but considers him a friend. Although he is the crew's doctor he wasn't originally hired by Luffy for that purpose. But actually, in Luffy's words, for being "cool reindeer that can transform".